18. And Jacob arose early in the morning, and he took the stone that he had placed at his head, and he set it up as a monument, and he poured oil on top of it. 19. And he named the place Beth El, but Luz was originally the name of the city. There are many many questions regarding these verses, and incredible interpretations and commentaries, particularly from Rashi. For example, why do the verses state that Jacob gathered "some stones" to place on his head, but then state that "he took the [single] stone that he had placed at his head?" What exactly do the angels represent, and why are they ascending and descending? One question that seems to particularly intriguing is perhaps the most basic of them all: where did Jacob have the dream? Was it in a town known as Beth-El (a city in the area of the tribe of Benjamin)? Was it at Mount Moriah? Be'er Sheva itself? Opinions vary, with even one commentary stating that the place of the dream was actually Mount Sinai. Furthermore, if the place of the dream is one of the above, why does Jacob give the place another name, "Beth El," the House of G-d, and why the Torah go through the trouble of telling us that the original name of this place is also none of the above, but is in fact "Luz?" With so many questions, Rashi's commentary is probably the best starting point. 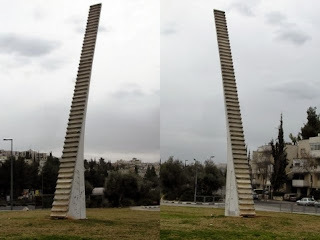 He first states that "The Holy One, blessed be He, folded the entire Land of Israel under him.” He later brings a Midrash that explains that the bottom of the ladder stood in Be'er Sheva, while its top stood in Beth-El, the boundary between the territory of Benjamin and that of the "sons of Joseph." The middle of its incline was opposite the Temple, on the boundary between Judah and Benjamin. Rashi goes on to state that he believes that Mount Moriah was "uprooted from its place," and came to where Jacob was, in Luz. Additionally, he brings a statement that Jacob went all the way to Haran, and then regretted not praying where his father and grandfather had prayed. He therefore went back in the direction of Jerusalem, and that it was on his way there that Mount Moriah, came to him, in Beth-El, which is close to Jerusalem. The first of Rashi's comments above makes clear that Jacob's physical location is not as crucial as his spiritual one, because the entire land was "under his head" while he was dreaming. It was as if he was in the entire land at the same time. Rashi's comment regarding the fact that Mount Moriah met Jacob on his way back to Jerusalem, points to the idea that as much as there is a physical Jerusalem, there is also the Jerusalem inside each one of us, and that a person is where his mind is. If a person's every desire is to be in Jerusalem, this is where he/she is. Where a person places their head, this is where the head of the ladder is as well. We can go by the physical Jerusalem and not feel it, but the spiritual one, we can feel even when we are not there physically. Regarding the third part of Rashi's commentary, there is a clear progression (heard once from a rabbi at Yeshiva University). Abraham called the Temple Mount a mountain, Isaac called it a field, and Jacob called it a house. We go from a place of complete "wild" (mountain), to one in which nature is present in a more subdued form, tamed by mankind (field), to one that is completely "civilized" (home). By connecting back to previous generations, and by our own efforts, we make a greater and greater home for G-dliness in this world. And as stated in Midrash Tanchuma, and as often stated in Tanya and Chabad Chassidic philosophy, the whole purpose of this world is because G-d desired a dwelling in the lower realms. We are told that Beit-El, the Home of G-d, was originally called Luz. Before we make a dwelling place for G-dliness, G-d's light is hidden. Hidden inside each one of us, and hidden inside each part of creation. The Talmud teaches that when Hashem created the world, for the first 36 hours of Adam’s life, he had clear vision in which he could see from one end of the world to the other end. This light, which was connected to the Sabbath, lasted from the time Adam was born (Friday at noon) until Saturday night. 36 in Hebrew is written Lamed Vav. The Sabbath, the 7th day, is connected to the 7th Hebrew letter Zayin. Lamed Vav Zayin spells Luz. Because of Adam and Eve's mistake, the original 36-hour light had to be hidden, and death was introduced into the world. However, each of us has a Luz bone, an indestructible part of us from which we will be resurrected when Mashiach comes. This bone is nurtured solely from the food that we eat on Melaveh Malkah. Rav Dessler explains that because this bone did not derive any nurture from the forbidden fruit (eaten on Friday), it never tasted death, and that is why it is indestructible. With the coming of Mashiach, Luz, the little hidden bone will be built into an everlasting body, our own personal temple. The original city of Luz, the hidden Divine light of creation, will be built into an everlasting House of G-d.
All of this is connected to the month that has just begun, Kislev. Kislev stands for Kis (Hidden) Lamed Vav (36). This is the month of Chanukah, in which we light 36 candles, deeply connected to the original 36 hours of Divine light. Chanukah means dedication, literally, the dedication of the Temple in the times of the Maccabees. It is on this month that we dedicate ourselves to the idea of the Temple and Jerusalem. We also dedicate ourselves to purifying our minds and bodies of all impurity, so that the light can be fully revealed.